This document is part of a collection leaked by the anonymous hacker collective known as LulzSec. Literally meaning “Party of God”, Hezbollah began as a militia in 1982 in response to the Israeli invasion of Lebanon. The Shi’a Islamist organization has since grown into a worldwide political and paramilitary network with seats in the Lebanese government, numerous social services programs, long-standing ties with the Syrian and Iranian governments, and an annual income estimated to be anywhere between $200-$400 million. Hezbollah’s main goal is to cast out any form of Israeli rule and/or occupation. Due to the U.S.’ political and financial support of Israel, Hezbollah regards our nation as a viable target. While there is no immediate or confirmed threat to the Tucson area, recent events and the current middleeastern political arena merit a renewed awareness of the group’s capabilities and presence throughout the Western Hemisphere. Made up of Puerto Iguazu, Argentina; Foz do Iguazu, Brazil; and Ciudad del Este, Paraguay, the area in South America known as the Tri-Border area (TBA), has long been considered a safe haven for organized crime and Islamic terrorist networks, including Hezbollah. As of 2002, the population of the TBA reached 630,000 of which approximately 25,000 were Arab or of Arab descent. Illegal activity in the region includes counterfeiting, money laundering, and the easy acquisition of false documents. The recent arrest of Moussa Ali Hamdan (mentioned above) confirms Hezbollah’s continued presence in the region. Based on a study done by Georgetown University, the number of immigrants from Lebanon and Syria living in Mexico exceeds 200,000. Along with Iran, Syria is one of Hezbollah’s strongest financial and political supporters, and Lebanon is its country of origin. In July of this year, Mexican authorities arrested Jameel Nasr in Tijuana, Baja California. Nasr was alleged to be tasked with establishing the Hezbollah network in Mexico and throughout South America. In April of last year, the arrest of Jamal Yousef – in New York City – exposed a weapons cache of 100 M- 16 assault rifles, 100 AR-15 rifles, 2,500 hand grenades, C4 explosives and antitank munitions. According to Yousef, the weapons, which were being stored in Mexico, had been stolen from Iraq with the help of his cousin who was a member of Hezbollah. 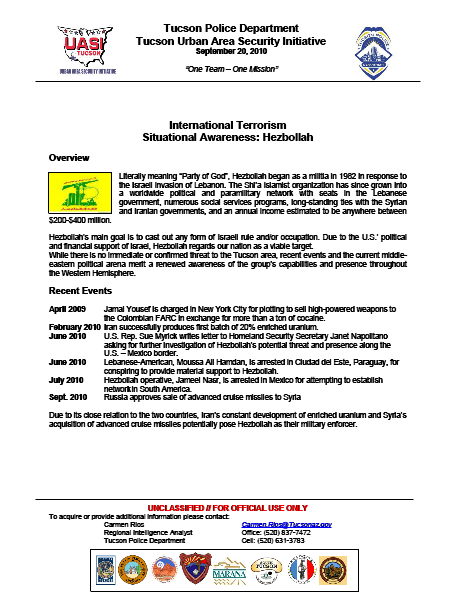 With the arrest of Jameel Nasr and Jamal Yousef, obvious concerns have arisen concerning Hezbollah’s presence in Mexico and possible ties to Mexican drug trafficking organizations (DTO’s) operating along the U.S. – Mexico border. The potential partnership bares alarming implications due to Hezbollah’s long established capabilities, specifically their expertise in the making of vehicle borne improvised explosive devises (VBIED’s). Recent incidents involving the use of VBIED’s in Mexico mark a significant change in tactics employed by DTO’s and conjures images expected to be seen in the Middle East. While no connection has been made, Hezbollah’s extensive use of VBIED’s raises strong suspicion concerning a possible relation to Mexico’s DTO’s.